I've been collecting music for over 30 years, and DJ-ing for over 25 years. My background goes back to my upbringing as a South London boy, with my mum proving to be a big influence with her record collection. In my early years I tasted the delights of Earth Wind & Fire, Stevie Wonder and Marvin Gaye and Curtis Mayfield. As well as enjoying Soul music as a youngster, I was also inspired by a friend whose records included ELO, Pink Floyd, Blondie, Thin Lizzy and Kraftwerk. Whilst the other 6MS boys were out partying hard in the late 70's, I was working my way out of primary school!! As a teenager during the early 80's, I was introduced to the popular pirate radio stations of the time (Solar, JFM, Invicta). I also discovered Electro Funk through a breakdancing display at a school assembly back in 1983 - this opened my eyes (and ears) to a new world, and from there the musical bug really took hold and has been relentless ever since. In 1986, I started to broaden my horizons and developed a love for Soul and Disco, investing in my first pair of decks and a mixer. As the 1980's moved on, I also became immersed in Funk, Rare Groove, early House and Boogie. The mid to late 80's in London was a real musical education for me. Over the coming years, I DJ'ed at various gigs in & around London, and had a residency at South Bank Polytechnic Students Union from 1990-1991 with my friend Shan. On top of DJing out and about, I produced a regular flow of mix-tapes to friends and colleagues which did the rounds. These showcased my varied taste in music, as well as his creative mixing skills. If any of you out there have one of these tapes, you'll know how good (and dodgy) they are!! In the late 1990's, after a theft at home which took away all of my equipment, I decided to let the DJing take a back seat. In the summer of 1999 having been asked to DJ for a friend's 30th Birthday, I realised that the passion that I had discovered as a teenager was still there. The years following this saw me carry on where I had left off, with various DJ-ing duties. In 2001, I set up Love And Happiness (LAH) with my old friend Shan, whom I had known since the 80's and had DJ'ed with before at South Bank Poly. 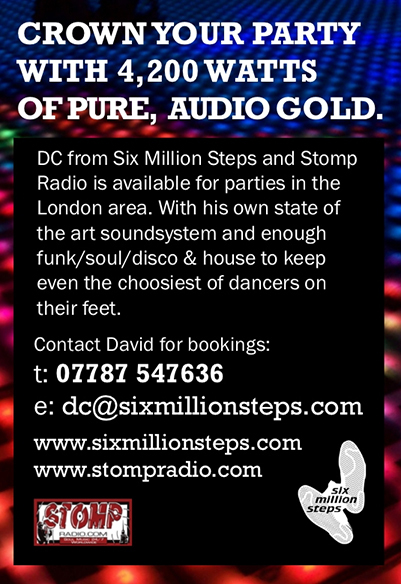 Over the coming years we held several very successful (and enjoyable) parties in London, mixing up a selection of Disco, Soul, House, Funk and anything else in between! In 2003, whilst busy with LAH, I made contact with John & Dave through the wonders of the world wide web, and soon realised that we shared a love of Disco and other great music. Since then we have spent many an evening drinking mugs of tea, and gushing over the virtues of rare disco 12"s. As well as acting as a guest presenter for their 6MS radio show on Worldwide FM, I even managed to present my own Love And Happiness show, before WWFM closed down late in 2004. In 2005, with the relaunch of the new weekly 6MS radio show on Starpoint Radio, I was asked to join the 6MS stable. Our weekly show on Starpoint Radio (6MS SESSIONS) ran for 4 years, before moving over to Stomp Radio in the summer of 2009. My varied and eclectic taste will mean I play anything from Carole King to King Britt, from Leroy Burgess to Boz Scaggs, from The Clash to MFSB. However, my main love of Disco is the one constant in my playlists, and I can be regularly seen salivating over long lists of Disco 12's on eBay. Nice!! !